This is what I got in an email today! I just took a tiny tidbit of the email, but I'm in! I am sooooo happy! 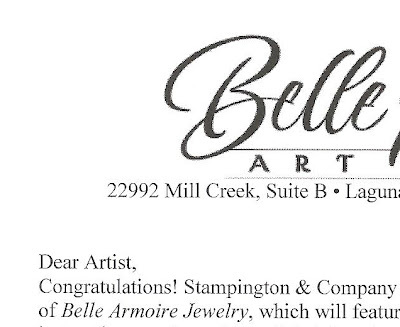 So...June 2008 issue of Belle Armoire Jewelry, I make my debute! LOL....I am tooting my own horn right now. Is it too much? I guess I am gonna have to set some more goals! This was number one on my list and it's done. That is if I can write an 850 word article by Feb 15th. Now that is the scary part! I must be off now....I have 5 flowers to make tonight. I will be posting tomorrow the outcome of these. Can I get all 5 done? We shall see. Congratulations Cindy! Good luck on that 850. I usually come up with about 85, then draw a blank! Congrats Cindy, hey a new goal could be to get in more than one magazine... You will do fine on writing the article. Just found your blog and had to say CONGRATS! Such exciting news!! How exciting Cindy!! And I am sure that you'll be able to write the article with no problem -- it's much easier when you're writing about what you love and do well.